Lake Bled is the most popular tourist destination in Slovenia and rather than do a day trip from Ljubljana, I decided to stay three nights at a small village half way between the lake and Radlovjica. The weather was bad on the first day so I took the bus to Radlovjica which is famous for its square (old medieval homes) and the Beekeeping Museum*. The museum exhibits were really interesting and there was a collection of wooden beehives and beehive panels. ** I also got to see a rehearsal for a concert that was being held as part of Radlovjica's ancient classical music festival. 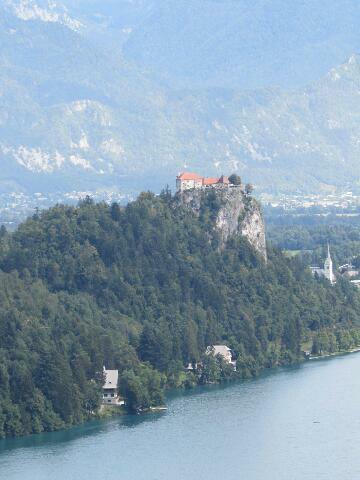 The next day I went to Lake Bled which is absolutely gorgeous. I walked around the lake and then hiked up to a viewpoint with two people who were as confused as I was about the trail. 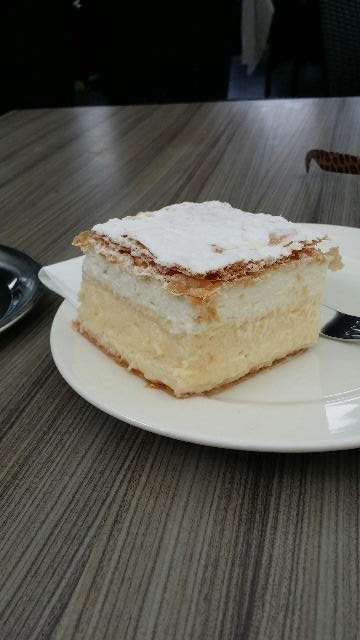 I finished with a piece of Bled's famous cream cake purchased. 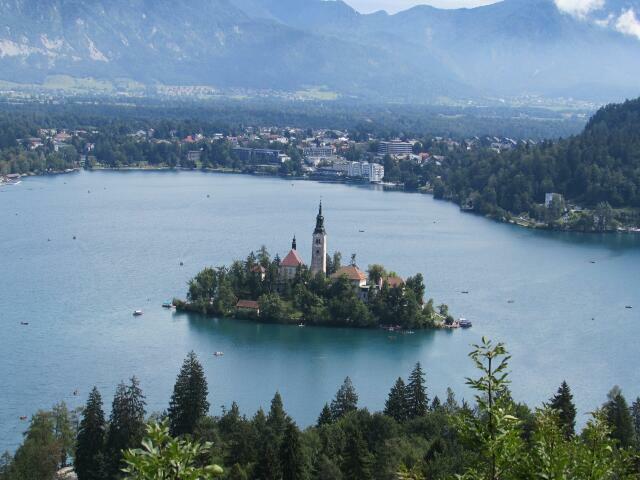 I'll be returning to Lake Bled with my sister so I'll visit Lake Bled's other tourist attractions when she gets here. 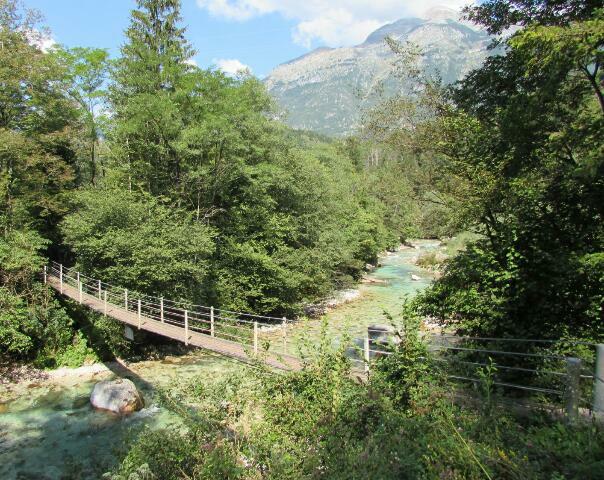 After Bled I travelled to the town of Bovec in the Julian Alps. We went through the Vrsic Pass which was built by Russian prisoners of war during World War I. There are 50 hairpin turns and it was really beautiful (but impossible to photograph). My first day I went on a great hike along (and over) the Soca River and the next day I walked a couple of trails outside of town and visited an outdoor World War I museum. I was supposed to visit another town in the area but once again I ran into problems with the bus schedule. Bovec is a fun town -- one night the museum put on a play and the next night there was traditional folk dancing and singing in the town square. A beautiful place; I would have been happy sitting and staring at the mountains for two days. ● The vegetarian burrito served at the widly popular Mexican restaurant in Lesce, Slovenia consists of tomato sauce, cucumbers and onions stuffed into a tortilla - no beans, rice, or cheese. ● Cleveland, Ohio has the largest population of people of Slovenian ancestry in the United States. ● I will always pack too much stuff and have the wrong suitcase. ● It is hard to type on a German keyboard. * Radlovjica also has a gingerbread museum but I didn't spend too much time there. ** I've become obsessed with beehive panels and I'll be bringing home a reproduction or two.